Shining Tor, the highest point in the county of Cheshire, lies in the Peak District National Park, on the border between Derbyshire and Cheshire. The hill rises to 1, 834 feet (559 metres). Some excellent views into Cheshire and Derbyshire may be had from its summit, to the south-west Shutlingsloe is visible, and on a clear day, Winter Hill in Lancashire, Manchester, Liverpool and much of the Cheshire Plain may be seen, including the radio telescopes at Jodrell Bank. The views into Wales include the hill of Moel Famau and in favourable conditions even Mount Snowdon. 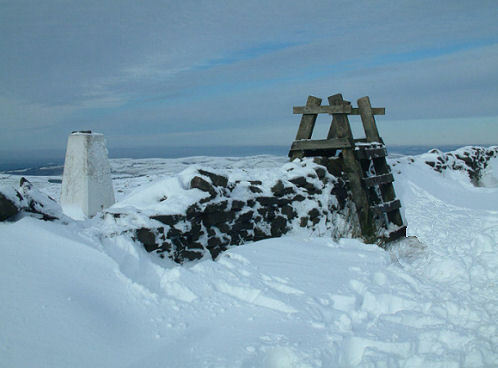 There are a number of routes to the summit, one of the most popular is that which leads from the Goyt valley by Errwood reservoir. It can also be reached with less ascending from the Cat and Fiddle Inn. *Commencing at the car park at the north western corner of Errwood Reservoir, turn right out of the car park and follow the road and follow that leads south along the side of the reservoir. Continue along this road almost to the southern tip of the lake, crossing over a bridge and passing a further car park. Just after the second car park, turn right and ascend the signposted footpath. *Continue along this path as it climbs up the ridge between Shooter's Clough to the right and Stake Clough to the left. Remain on the ridge line, ignoring offshoot paths. At the top of the ridge, cross over the wall to the right, and head along the path that dips down, before climbing directly towards the summit of Shining Tor. *Be safe- plan ahead and follow any signs.